You've been fired — again. Are you starting to sense a pattern? The solution to any problem is to look at the root cause. While the job might simply not have been a good fit, people who have suffered a string of job terminations might want to consider that they may be a small part of the problem. No, I'm not saying you deserved to be fired — but you may be engaging in sloppy or naive behaviors that don't do you any favors in the workplace. 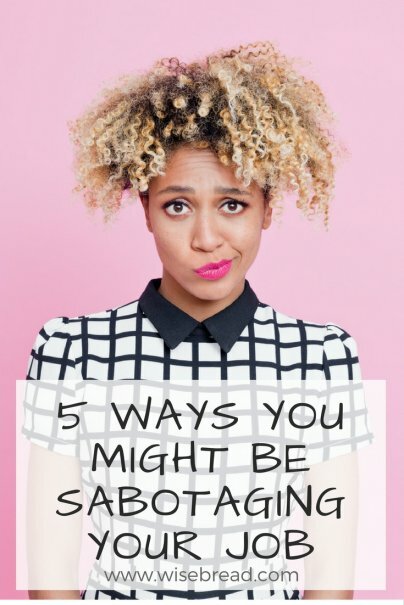 Here are five bad behaviors that might be sabotaging your job. Do you have grand plans to escape your current job? Do you plan to jump ship in two or three months? Stop and think before you mention it to any coworkers — including those you consider friends. Word gets around the office quickly, and sooner or later, the news will make its way to management. Next time the higher-ups need to lay someone off, individuals with one foot out the door might be the first to go. Even if you don't seriously plan to start sending out resumes tomorrow, your company won't be incentivized to keep someone around that they suspect is actively looking for another job. Can you afford to be pre-emptively fired? If you can't, wait until you actually have a new position lined up and intend to put in your two weeks' notice. Unfortunately, people can be pretty mean, and high school behaviors aren't always left in the past. Water cooler gossip runs rampant in many professional settings, but don't let that be an excuse to join in. As tempting as gossip can be, you need to steer far, far away from it. Your colleagues may have some bad habits. They might watch movies on their computer, or mess around on Twitter all day while on the job. Don't assume that because they're getting away with it, it's fine for you to do the same. There may be more to the story than you realize. Maybe management doesn't care if your coworkers are messing around on Twitter, because they do their job well and turn in assignments on time. Maybe office politics are at play. Maybe your office mates are just good at not getting caught. Regardless of their situation, if you're regularly following in their footsteps and slacking off, you could be putting your job at serious risk. No one is immune to criticism, and at many jobs, you'll be subject to regular performance reviews. Savvy professionals should keep an open mind, make note of the manager's suggestions, and work to create an actionable plan to improve their performance. Blame everyone else without looking at their own part in a problem. Deny knowing about an issue if the manager has brought it up a dozen times. Refuse to acknowledge a problem and discuss improvement. Try to shift the subject by bringing up coworkers' issues. If you don't quite understand why the manager has an issue, you can initiate a respectful discussion. Just make sure that the manager understands the discussion is to help you grasp the problem, so a solution can be properly discussed. Yes, jobs can be soul-sucking grinds. Yes, the managers might be slimy ladder climbers. Yes, you might feel that the organization takes every chance to whittle away at your quality of life. No, you shouldn't aggressively express your displeasure with every word and action. Why? One individual with a bad attitude can insidiously infect the quality of the entire workplace. An unhappy employee can pass on their discontent and anger to their coworkers. Weeks of murmurs about all the perceived problems will eventually negatively affect everyone around you. A bad attitude can also lead to subpar work and rude behavior toward customers or coworkers; both of which can eventually lead to a job termination. No one expects you to be upbeat and perky all the time. Just try to rein in the attitude a tad.